Maybe we got bogged down in the details when I wrote about this before, but I think it’s silly to pay for things that are free. In fact, one of the best decisions I’ve made on my journey toward a simpler, more responsible life is making every effort not to pay for things that are available at no cost. This is the eighth in a series of 10 posts detailing the best decisions I’ve made on my journey toward a simple life. By revisiting these topics, I hope new readers as well as established ones will benefit from some of the lessons I’ve learned and am learning. What do you think about spending your money on things that some people get for free? The silliness of paying for things that are free is more about the silliness, perhaps, than about getting things for free. I think there is something very seriously wrong with the values of someone who pays for things that are available without cost, don’t you think? This kind of lapse in judgment is a symptom of a bigger problem — a symptom of a life so out of control that simple decisions aren’t all that simple anymore. We got bogged down in the details of what kinds of things are available for free last time we talked about this. That was in a post called The Silliness Of Paying For Things That Are Free on April 11, 2011. We discussed how bottled water is silly because water by the glass costs most people nearly nothing or is completely free. Paying a dollar or two for something that comes with your home or is available by the hundreds of gallons for the same money just doesn’t make sense. It doesn’t make sense to pay for a checking account in the United States either when there are still free options — although there are fewer free choices than there once were. It also doesn’t make sense to pay for having your tires rotated when some tire chains do this for free, sometimes even if you didn’t but the tires from them because they want you to buy your next tires there. If you think about it, the conversation actually extends far beyond the things we discussed before. I’ve paid to have an electrician change a light switch and to have a technician change the oil in my riding lawnmower. I feel silly about that now. I’ll no longer pay for those services because I’ve learned to do those things for myself — despite my general ineptitude with electrical and mechanical things. But none of this is really the point of this discussion. The point is this: It’s silly to make bad decisions. If you’re paying for things you could be getting free, your life is very likely in need of some careful attention. I think you really need to assess where you stand, then shift your feet a bit until your toes feel solid ground. 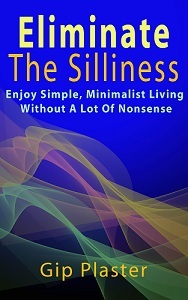 Eliminating as much of life’s silliness as possible is one of my best decisions. Have you made this really good decision yet? Maybe we missed the point a bit when we discussed paying for free things last year, but let’s explore both parts of the discussion now. Do you get my point about the ridiculousness of shelling out for things that people and companies are willing to give you at no charge or that have been included in something for which you have already paid? This is a very similar point to the one I made in my recent post about eliminating trash service, and I’m sorry to say that I’m not sure I fully made my point on this topic then or now. In any case, the other part of the discussion is about the ways we manage to find free options in cases where others may be paying. What are you getting for free? I hope your bank account and your tire rotations are free, but what else are you getting for nothing? If you think there’s no such thing as free lunch, stick around. Someone, I’m sure, will tell you how to get one. As always, the comments section is open, and I’m expecting to learn a lot about getting something for nothing from you today. I’m also expecting you to tell me that my campaign against silliness is, well, silly, but it’s my lifelong crusade nonetheless. I don’t pay for books (other than require textbooks for classes that are actually needed). I’ve found the library to be a great resource. I’m also finding that most information in ebooks is readily available or rephrased blog posts. Sorry, not paying for that! I love libraries too. They’re changing animals these days, but they still have books and other great things like DVDs, audio books and computer workstations with fast Internet, for example. This, as you may know, is an ebook-free zone. I don’t promote ebooks. They’re often rehashed material, and they’re almost always clutter in one form or another. I’m not paying for or promoting that either. Just be careful you don’t confuse “e-books” (self-published works of unknown quality or value) with “e-books” (electronic copies of traditional works). I realize that as a used bookseller you might have a vested interest in the dead-tree editions, but e-books are a great way to save physical space for those of us with little to spare. Just because a written work is available in electronic form does not automatically make it “rehashed” or “clutter”. Don’t confuse the content with the container. Most mainstream works by respected authors are now available electronically, and I’m happy to read them that way. I’m not really a used bookseller anymore. There’s not much left of my bookselling business, I’m afraid. I wouldn’t mind being in that business, but both the supply and the demand have decreased dramatically. There is a difference between the two kinds of ebooks, but I don’t generally promote publications of any kind here. I’m sure there will eventually be an exception. Well, I’m pretty handy, so I don’t often pay for services (mechanical, electrical, etc.) — I do most of that sort of stuff myself. As for things that many people pay for, but I don’t, how about television? It comes free over-the-air. Radio too. I don’t pay to go to a gym to exercise – I just go outside and take a walk. I don’t do bottled water. I rarely buy a cup of coffee – I can make a better beverage at home for a tenth of the price. I almost never pay to see a movie in the theater; if I wait a couple months I can watch it at home for much less, and without the distraction of crying babies, screaming kids, and chattering adults. That just scratches the surface, I’m sure. At the other end of the spectrum, I also sometimes don’t even pay for a place to live. Sometimes I barter work for a campsite, and other times I stay on public land – totally free (or nearly so) and completely legal. Freecycle.com is one of the best inventions of the internet. Give away those things you are done with and get the ones you need with no cash exchanging hands. That’s a good point. I used it once. It can be time consuming and competitive, however. It’s a good way to get something for nothing, and that’s exactly the point of this post. I have a non-Kindle ereader and recently downloaded the Kindle app so that I could take advantage of all the free contemporary fiction available on Amazon. Prior to that, I enjoyed reading tons of classics (also free). I figure I don’t have enough time left in the second half of my life to read everything out there that is free, so why spend money on books? Unless, of course, there is a specific book I need. But for pleasure reading? There’s just no way I can live long enough to read it all, even if I had a million years left. So I’m having free fun sampling new-to-me authors. Crystal recently posted Amazon Book Review Rebuttal – Are You Kidding Me? That’s another great way of getting something for nothing. Thanks for mentioning it, Crystal, and thanks for commenting. It’s always nice to read your comments. I hate paying for cable and internet service. Does anyone have any ideas on how to get these services cheaper? I know I can go to the library to use my laptop but I waste gas that way and they are not open very late. I don’t like buying water but I do like flavored water like Propel. That is one of my “wants”. I have a filter pitcher for when I drink it plain, which is not often. I know this is a waste of money. I need to experiment with lemons, limes or other flavors to flavor my almost free water from the tap. I’m looking forward to hearing how I can get things for free. I replied in the post about garbage about how my trash fee is added to my water bill each month along with sewer fees. I don’t know a way around that. Very interesting post. I’ll have to think about this. Another comment…I called Mediacom to come out and put my tv cable on the other side of my room as I am redecorating and I don’t want to add 10 feet of extra cable across the room. I wanted my internet modem placed in another room also. Now mind you, they would not have to drill new holes, just go under my house and switch out two cables. They said the charge would be $29.99!!!! What to switch out two cables? I said forget it. Now, if my son still lived in town he could do it in a heartbeat. I’m not so sure I can handle going under my house on my hands and knees and do it. We have tons of spiders. So I will probably just use a 10 foot add on cable and try to make sure it cannot be seen or look tacky. I know when I was working at regular jobs most of the time I was so stressed I would pay for ANYTHING that made things easier for me. I would buy food out, or have a ton of frozen easy to fix foods in the freezer. I know for me personally, when I had more money and less time I probably wasted a lot of money because I was just too tired and stressed to think about it. It was a shame. Joni – It was the same with me. When I was working, I spent more on groceries, stocked up more, more things went to waste and we went out to eat way more. Now that I’m home, I see a huge difference in the amount of money we spend on groceries (no more warehouse clubs for me – the cash flow just isn’t there), smaller meals prepared for no waste. Even to the point that our clothes are lasting longer because I can take the time and care that is needed to do the laundry ‘right’. I think back to the waste we had when I was working and it disappoints me too. I think we could have saved so much more money… But education, I suppose, is never free… I approach things with a much different mindset now. When I think back to how frivolous I have been in the past, it disappoints me. All of a sudden with the tables turned and the double income out the window, all those little tubes of toothpaste from the dentist, pens from random sources, free trial size products and offers for help seem so much more important. It has been a real learning experience. I almost think I had/have an irrational fear of running out of things. In that vein, I always stocked up on things way too much and those little freebies seemed to be wasted. Pretty silly to have happen, isn’t it? With the cash flow in our house having changed (and not always there! ), I have learned to buy smaller quantities, use them up, and utilize everything I can to stretch me to the next time I can buy. So, all those little bottles of contact solution given to my by the eye doctor will be used before more contact solution will be purchased. I have been monitoring this lately and it has really saved us money here and there. I agree. I appreciate things so much more now that I’m money poor. My daughter (a pharmacist) and her husband (a computer programmer) waste so much I just cringe. I offered to help them. He wanted a housekeeper and I said I’d do it for free. They helped me out so much when I first lost my job 2 years ago I could never repay them in money. She told him no they were not gettng a housekeeper. They are just like I was when I was rushed, stressed and had no time to repair things and organize. At least we’ve learned from it. I appreciate things more now too, Joni. Thanks for the comment.